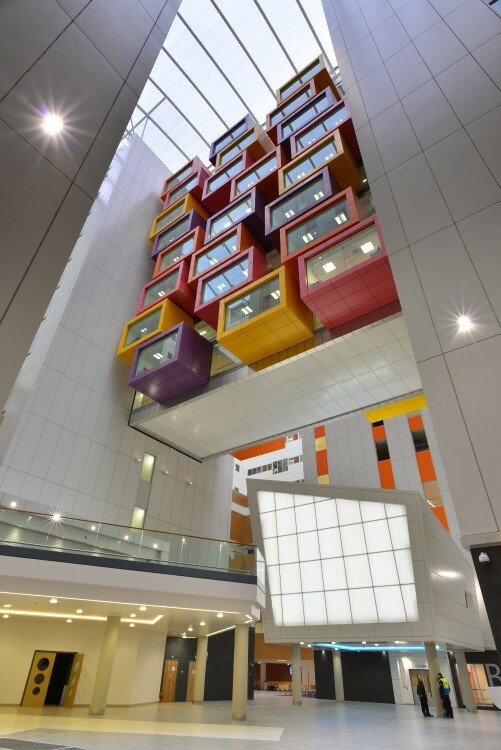 The new South Glasgow University Hospital and Royal Hospital for Children, which was officially opened by Her Majesty the Queen on July 3rd and consequently renamed the Queen Elizabeth University Hospital, is a benchmark project for many reasons. One is its size – being the largest hospital building project in Europe to date, and another its design for client NHS Greater Glasgow & Clyde by specialist healthcare architects IBI Group (formerly Nightingale Associates) – which is colourful and brave in its use of internal “floating” cantilevered pods, among other elements. First impressions aside, it is equally ground-breaking in the background, being the largest off-cut recycling project to date by Armstrong Ceilings who diverted more than 10,000m² or 35 tonnes of mineral ceiling tile off-cuts from landfill. Main contractor Brookfield Multiplex had worked with Armstrong before to recycle 8,000m² or 32 tonnes of Bioguard Plain ceiling tile off-cuts at Peterborough City Hospital. It was also the largest project to date featuring elements from Armstrong Ceilings’ service and systems portfolio – not just tiles for acoustic and healthcare purposes but also a variety of suspension and Dry Wall Grid systems with bespoke Axiom perimeter solutions – backed by the company’s industry-leading 30-year systems warranty. Such was the size of the project that it required two members of Armstrong’s Green Omega network of specialist sub-contractors especially recognised for their recycling expertise – Roskel Contracts and PFP. The project was also noteworthy for Roskel Contracts, who installed the first, laboratory phase – 30,000m² of Armstrong’s lifetime-guaranteed Dune Supreme Tegular mineral tiles on a Prelude 24mm grid – becoming the first Green Omega member in Scotland. Armstrong worked with Roskel Contracts to create 800m² of exemplar mock-up areas of two sizes (600mm x 600mm and 1200mm x 600mm) of the square-edged Bioguard Acoustic tiles which combine good sound absorption and attenuation to ISO 5 levels with antimicrobial properties. PFP then had a team of up to 60 men on site for two and a half years, installing 110,000m² of Armstrong’s Bioguard Acoustic mineral tiles and a variety of wall-to-wall suspension and transition systems. The 140,000m² of Armstrong wall-to-wall ceiling systems used at the new hospital also include the manufacturer’s pre-engineered aluminium perimeter solutions Axiom transitions, profiles and accessories. In addition, in the cantilevered pods that are the most jaw-dropping element of the project, a 100mm Axiom profile was coupled with a bespoke 225mm Axiom profile and riveted together to create a 325mm bulkhead/upstand at a custom length of 3.6m. This particular method took just 25 percent of the installation time compared to traditional plastering methods, prompting PFP to remark that this Armstrong system represented the next generation of building products. 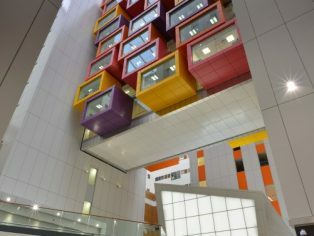 A variety of Armstrong suspension systems were also used on the project including 70,000 linear metres of the Drywall Grid System for use with plasterboard ceilings (including curved DGS around the nurses’ stations in the wards), 12,000 linear metres of Axiom plasterboard-to-tile transition trims in corridors leading off a central atrium, 10,000 linear metres of Axiom profiles (which help with ceiling level changes, floating ceiling construction and lighting integration) and 40,000 accessories including connecting brackets, clips and hanging brackets. Along with the Armstrong Prelude standard and non-corrosive exposed grids which combine exceptional stability with installation ease, all of these systems were installed by PFP a year before tiling to minimise damage to services in the ceiling void. In keeping with its size, the new hospital on the site of the Southern General Hospital took five years to build. The 170,000m2 combined adult and children’s hospitals are expected to treat 750,000 patients, including 110,000 A&E patients, every year. It has one of the biggest emergency departments in Scotland, 30 state-of-the-art operating theatres and a dedicated laboratory block. The mammoth development is divided into two elements – the larger adult hospital of 1,109 beds in single-room accommodation and the adjoining smaller children’s hospital with 256 beds. The former also comprises two separate sections, the first a three-storey podium housing operating theatres, diagnostic, outpatient, ambulatory care and emergency facilities. The second is an eight-storey tower rising above the podium with a helicopter landing pad on the roof. The adult building has also been designed with a large atrium housing retail shops, cafe, restaurant and coffee area on the first floor. Patient rooms overlook landscaped gardens to help promote a sense of well-being. Home to major specialised services such as renal medicine, transplantation and vascular surgery, the publicly-funded development will give Glasgow one of the most advanced adult acute services hospitals in the UK and is the biggest critical care complex in Scotland. James Bailey, senior quantity surveyor (construction) for Brookfield Multiplex, said the Armstrong wall-to-wall ceiling systems specified by the architects had met all the required SHTMs (Scottish Health Technical Memorandum), were a “suitable product range for a major hospital” and had been used extensively as a major internal fit-out component throughout both the adult and children’s elements. At the new Queen Elizabeth Hospital, the off-cuts from the ceiling tiles supplied by the Glasgow branch of distributor CCF were collected in one-tonne bags supplied by Armstrong. These were then gathered in an on-site holding area by on-site waste management company Skipeez until there were enough (20 bags on pallets) for an Armstrong truck to collect them and transport them back to the factory in Gateshead. “The sheer size and complexity of this project could have made it an extremely challenging one but the recycling element, particularly with Skipeez on board, went very smoothly.